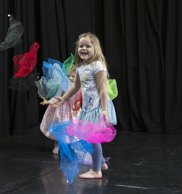 Barbican Theatre are delighted to announce it will be introducing two new classes for younger children aged from 18 months to 6 years, as part of it’s young people’s Performance Trainingcreative dance and theatre programme. Barbican Theatre offers young people the opportunity to be creative on their own terms. Their Performance Training programme provides high-quality training in a fun and inspiring way, perfect for improving health and well-being, social interaction and self expression. Twinkle Steps is a specially developed programme that will inspire and motivate young children to enjoy ballet and dance through imagination and play. Twinkle Steps classes are designed to capture attention, develop coordination and creative exploration. Helping develop a child’s imagination and learning a good foundation of dance skills along the way. There are three sessions: 1½ years to 2½ years (Mondays 10:00am – 10:30am), 2½ to 4 years (Mondays 10:45am – 11:25am) and 4 to 6 years (Mondays 4pm – 5pm). “These new classes are ideal for developing fundamental ballet and creative dance skills, while making friends at the same time! Suitable for both girls and boys who want to have fun, use their imagination and develop and explore their creativity through movement”. Little Bs is perfect for pre-schoolers who want to let their imagination grow through creative and playful storytelling. They’ll make friends, develop confidence and improve their health and well-being. And of course they’ll have great fun too! Little Bs is for ages 3-4 years and sessions run on Mondays from 1:30pm – 2:30pm. The new semester starts from 12 September and we’re holding two weeks of no obligation taster sessions during that week and the week after. Those interested in attending should emailbtpt@barbicantheatre.co.uk, call 01752 267131, or fill in the form on our website www.barbicantheatre.co.uk/workshops. A unique space where imaginations grow through playful exploration of theatre making, storytelling and dance. Participants have fun, grow in confidence, develop social skills, make and have the opportunity to perform in a professional theatre. Participants physically and vocally explore their imaginations, through a variety of styles whilst developing technical and creative skills. As they create and perform stories and dance pieces in a professional theatre they also develop confidence, social skills, and learn how to communicate. Participants experiment with different dance and theatre styles and genres whilst learning and practicing contemporary, challenging dance and theatre techniques. They have fun, make new friends, develop confidence and create original performances with leading dance and theatre practitioners. To register for a taster session or workshop audition, email btpt@barbicantheatre.co.uk or call 01752 267131. Visit www.barbicantheatre.co.uk to find out more about Barbican Theatre and their Performance Training programme.